I was blown away! I couldn’t stop smiling, and neither could she. Her gesture of kindness honestly made both of our mornings. This afternoon when I sat down to write, I immediately thought about my joyful encounter this morning, and the first thing that came to mind was, “That wonderful lady really took a chance on me.” Which got me thinking about all the chances we have to make our lives a little brighter and happier, and how many of these chances we never take. 1. Take a chance on others by giving them a hand. Ultimately, your greatest successes in life will not be measured by how high you have climbed, but by how many people you have helped up with you. This is how success leads to happiness. What goes around comes around. It’s impossible to not feel good when you are doing good for others. Today, help those around you and celebrate their strengths. Lift them up and help them thrive. When you choose to see and support the best in others, you end up finding the best in yourself. 2. Take a chance on your dignity and self-worth. Be strong enough to let go and wise enough to fight for what you deserve. Sometimes you have to get knocked down lower than you have ever been to stand up taller than you ever were before. Sometimes your eyes need to be washed by your tears so you can see the possibilities in front of you with a clearer vision again. Don’t settle. 3. Take a chance on imperfection. If you always look for perfection, you’ll always look unhappy. When you stop expecting people and situations to be perfect, you can start to appreciate them for who and what they are. Imperfections are important, and so are mistakes. We get to be good by learning from our mistakes and we get to be real by being imperfect. Today, be tolerant of people’s mistakes. Sometimes good people make bad choices. It doesn’t mean they’re bad; it simply means they’re human. Likewise, learn to walk in your own shoes imperfectly. If you want to truly grow into your best self, let go of the notion of perfection and replace it with the notion of endless playful exploration. It is better to live your own destiny honestly, joyfully and imperfectly, than to live up to one of society’s contrived expectations with perfection. 4. Take a chance on the present moment. Endless worry and rumination are the enemies to living in the present moment. The search for happiness is sometimes the main reason for unhappiness. Enjoy your life today; don’t wish it away by waiting for better days ahead. Accept and appreciate things now, and you’ll find more happiness in every moment you live. 5. Take a chance on your heart and intuition. Happiness comes more easily when you feel good about yourself without feeling the need for anyone else’s approval. As long as you are worried about what others think of you, in a way, you are owned by them. Only when you require no approval can you truly own yourself. Listen to your soul. Trust your intuition; it will rarely lead you astray. If it doesn’t feel right in your gut, then it probably isn’t. So stop worrying about what you’re supposed to do and start doing what you know is right. No matter how you live, someone will be disappointed. Just live your truth and be sure YOU aren’t the one who is disappointed in the end. 6. Take a chance on doing the right thing, even when no one is watching. Most of the good things you do will go unnoticed by others. Do them anyway, because you will notice. Many of the contributions you make will not be fully realized by others. Make them anyway, because you realize they are the right things to do. It’s great when you receive recognition for the things you do, yet even when there is no possibility of recognition, YOU still recognize the reasons you are putting forth the effort. Your honest, authentic view of yourself influences all that you do. And that view is formed mainly during times when no one is watching. Your life is a living expression of who you know yourself to be, regardless of what others think or see. 7. Take a chance on feeling vulnerable. We often keep our hearts and minds closed, not because we don’t trust others not to hurt us, leave us, or let us down, but because we don’t trust ourselves to survive the pain if they do. How ironic, considering that only by opening up and suffering through this type of discomfort, do we come to realize our true strength and potential for peace of mind. Take any emotional feeling – love for a significant other, or grief over a lost family member, or fear and pain from a deadly illness. If you hold back on your emotions and you don’t allow yourself to go all the way through them, you can never get to the point of being detached from them. In other words, if you spend all your energy being afraid of feeling your true emotions – the vulnerability that love, sincerity and acceptance entails – you will be forever stuck. 8. Take a second chance whenever possible. We all need second chances. This isn’t a perfect world. We’re not perfect people. I’m probably on my 1,000th second chance right now and I’m not ashamed to admit it. Because even though I’ve failed a lot, it means I’ve tried a lot too. Most of the time the only difference between winning and losing is not quitting. We rarely get things right the first time. Almost every major accomplishment in a person’s life starts with the decision to try again and again – to get up after every failed attempt and give it another shot. Live, learn, and let go. Don’t hold yourself down with the things you can’t control. Don’t carry your mistakes around with you. Instead, place them under your feet and use them as stepping stones. If you take another step, and another, you’ll be surprised to know how far you can go from the point you thought was the end. Every moment gives you a new beginning and a new ending. You get a second chance, every second. Just because something doesn’t go as planned, doesn’t mean it wasn’t worth your while. Sometimes you have to fail forward, by learning what doesn’t work to discover what does. Life is a journey that’s only traveled once; don’t waste it. Today’s moments quickly become tomorrow’s memories. Appreciate today for what it is and make your time count. Make it memorable. Don’t let your coulda’s and shoulda’s of yesterday determine your can’s and will’s of today. Live your life so that you never have to regret the chances you never took, the love you never let in, and the gifts you never gave out. What would you add to this post? What chances do you need to start taking for your happiness and well-being? Leave a comment below and share your thoughts. Loved this post and could find myself nodding along to every single point you make. But #7 resonates most with me today. It’s uncanny how much personal growth happens during our most challenging, vulnerable times. An impressively insightful and deep post. As I read each idea outlined here, every single one of them continue to be as poignant as the ones I began to read so many months ago when I first found your blog. 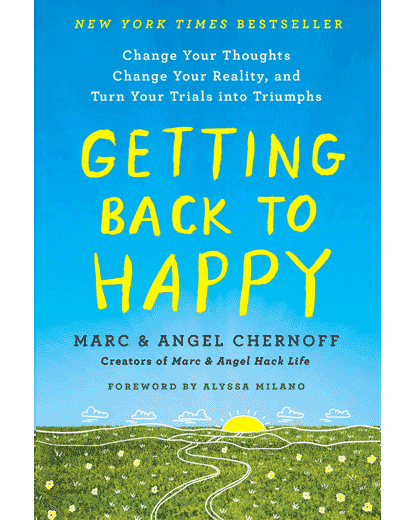 Thank you, Marc and Angel for helping to open up my heart and mind in such meaningful and positive ways. Stunning. As for my addition: I need to start giving myself permission to take second chances. Too often I get wrapped up in my failures, and give up far too early. PS: I love your book, and I’ve also given it as a gift twice. Thank you. Thanks!! Just what I needed right now. LIG!! My favorite is #5. Right now I’m really focusing on trusting my intuition. Your wonderful cashier post reminds me of day, maybe 15 years ago. I had stopped at a rest area. It was a really hot day, over 100 degrees (which counts as really hot in Western Oregon) and the soda machine refused to take my money. A nice couple bought me a drink and even refused payment (which I had – the machine just didn’t like my coins). I think the telling thing about this story is not so much that they spent 75 cents or $1 on a stranger, but that so many years later I think of it often, and it reminds me to be kind to strangers as well. Do take a chance on people – you never know when something will make a big difference in someone’s life. I loved this post, especially your words on embracing imperfection + being vulnerable. While these seem like such scary concepts, they really are the keys to living a joy filled life. It is ironic that in order to love fully we need to learn to be vulnerable, but to do this we must first face our fear of putting our self ‘out there’. Likewise with imperfection – facing our fear of not being enough but loving ourselves despite our imperfections is truly liberating. Thank you for this post! I agree with the every word of this post. Just want to add to your first point… Little, kind actions from strangers can mean the world to people, and making someone happy doesn’t need to be difficult either. Just take a chance and make a small, kind gesture to the person closest to you whenever possible. I would have to add — take a chance with money. Not in a gambling sense, but if it means going part time and earning slightly less oney so you can pursue a passion or hobby… then you might end up happier in the long run. I have always hesitated several times to fight for what I deserved.. May be it could be lack of self confidence, feeling of being knocked down.. but recently, I stood up, fought for what I thought was right, without giving a damn to the consequences. and great it was… I won the battle!! Thanks for all your posts, Marc and Angel.. you are doing great service, Point # here!!!! Facing some difficult times in my career now and reading the post is just what I needed. Yesterday a good friend of mine in the office gave me the book that is on Having Faith Even When Tested. This post and that book make me realise that no matter how bad things seem to be, there will always be an upside sometime and somewhere. And today, there really was. Thank you for this. Married & divorced three times, still pining for my current love of seven years. I have finally recognized my fear of relationships. Your advice comes as I stand at a crossroads. I no longer want to have this CAGED HEART. Thank you for reminding me to trust my heart & step forward. I just love your website – it’s my daily dose of positivity! I am a new subscriber and I look forward to each article. Keep them coming! Perfect words of inspiration for me today! Recently, I too had a similar dilemma at a food market. I wasn’t a regular customer and they allowed me to take the items and bring cash back the next time. Never asked for ID either. Truly you get what you give! My days are always filled with thankfulness! This was just what I needed to read today. For me, it is a reminder to dig down deep and realize I have the resources I need to take a chance and live life to the fullest. Thank you. When you ask, “What’s in it for me?” over and over again, this indicates to me that all you do is give and give without receiving. Or you give because you feel you have to or should give. The point of giving or doing something for someone is because you want to. To break the cycle of “What’s in it for me?” give when you want to and help when you want to. Stop doing and giving out of obligation or because your parents raised you with the belief that it’s bad to receive. Giving and receiving must be balanced. “I’m probably on my 1,000th second chance right now and I’m not ashamed to admit it.” Me too! My favorite line: “We get to be good by learning from our mistakes and we get to be real by being imperfect.” Amazing. Be strong enough to let go and wise enough to fight for what you deserve……But how do you know which you should do???? Love this post. I am working through a big challenge at work that makes me feel used, frustrated and boxed into a role that is really another person’s to bear. Strangley this is actually making me rather anxious to stay in this fight longer, because in my mind I know this is the key project to getting me to my next position. A bit on perfection. In many cultures only God can make something perfect. In Islamic cultures you will find a wall in a building that is completely ill-formed and badly made…a glaring example of imperfection meant to show that man cannot make anything perfect. Also, perfection changes. You can be a model student in high school, but struggle in college. Be a great boyfriend, but a lousy husband. Be a great Mom, but cannot work a part-time job. This seems too easily said, and often difficult to do..fear of taking chances, of being authentic can come with huge risks- what if it’s rejected? That’s the cycle. Good intentions, poor execution. I am also one who has more self inflicted wounds, broken promises to myself, disappointing moments,failures, tears shed, and yet..I keep pushing for being authentic. I keep looking for the silver lining.It’s been said that the definition of insanity is repeating the same behavior but expecting different results…I keep working on this life I live, and I expect to change as I learn…is that insane ? My mistakes are a mile long, but I’ve gained a world of wisdom from them. My goal? To keep my desire and passion for life unbridled and to appreciate that without my mistakes, I may have missed out on seeing beauty in even the smallest things. A beautiful post. Been working on getting better in most of these things! I’m talking more instead of thinking. That public speaking class has really helped me out and to guys too. I deserve a date. I think I may read it every day for awhile. Thank you for this. I really needed to be reminded of #1. It’s been a while and I’d forgotten. Love, Love, Love this…thank you so much for putting it out there and giving me the strength to continue on the journey to being my best self. #3 strikes me the most… take a chance on imperfection. This line was just so perfect for reflection: We get to be good by learning from our mistakes and we get to be real by being imperfect. This has me just about in tears (personal). Thanks Marc And Angel for the wonderful inspiration. I’ve been reading your blog for awhile now & this is my favorite post! Love # 4. Thank you! You got me from the start with this; #1 really resonates with me. Doing a lot of hitchhiking back in the days, I saw first hand what a little kindness between strangers can do. Remembering all those awesome people who picked me up and gave me rides really makes me feel grateful and wanting to give something back to the world. Now, I always try to practice this point of giving a hand to those who need it. I think #6 is the most important point though; even though no one notices right away all the good things you do, they will build up and yield great rewards in the long run. I see this as a sort of investment in the present to make the future better. My friend had the same experience with her card at our local eatery the other day. They told her “no problem, lunch is on us today”. She even tried to pay them the next time we went in and they refused to take her money. They are all about customer service and connecting with the community. Even though I wasn’t with her that day, she has shared this story many times over with co-workers and friends. It made her day! Live your truth, inspired. Great article! I was someone who always needed a Guru, a mentor, a Coach. Then I got disillusioned by each one of them, realizing in the process that I just needed to be centered within. Just be honest to myself and do what is right. Honesty, authenticity within and without. To be fearless in thoughts and actions because we have the confidence in our convictions. Thanks from the bottom of my heart. In your blogs, I find all the reassurance and guidance I need. Taking a chance rather I would say calculated risk is most critical part of life. Here the cashier took the chance because she knows the buyer and the risk is less than $10. BTW, this is an excellent post. Awesome piece. Actually, I feel like thinking a bit more positive about life now after reading this. My addition would be to take chance and not be afraid of failures. Something that I am always worried about and hence won’t open up to often enough. My suggestion goes with #5. Take a chance and follow your dreams and passion! When I tried to live a life that I thought was expected, I was miserable. Instead, I sat back and considered what I really made me happy. I realized I was on the wrong path for me. So I quit my job and went after my dream. While in some ways I’ve had to start over (new career), I am happier than I’ve ever been. @Dev and Rachel: You got it! Vulnerability is the gateway to strength, love and growth. @Christy King: Such a great story. Thanks for sharing. And I’m glad it inspired you to pay it forward. @Clare: Excellent point. Angel and I actually followed this to a T. We gradually shifted our focus from our day jobs to our blog over the course of many years. @Crizz Ikhsan: No doubt about it, life is a continuous series of ups and downs. Success and happiness is the result of riding the waves. @Deb T: Inspiring! Best of luck with your relationship. @Jan and Valerie: More amazing stories of generosity. Thank you for sharing them. @Amandah: Agreed, balance is important. My point is simply not to be so self-centered that you lose sight you your contributions to others. @Justine Playford: Thanks for the recommendation. We’ll check it out. @lyn: The concept is: Let go of what you can’t control and focus on the things you can. Don’t sell yourself short by being defeated by life’s inherent challenges. @David Rapp: As always, amazingly insightful points. I your take on perfection changing. It’s so true that our idea of perfect changes simply because “perfect” is just an opinion. @Jen: Read the book Daring Greatly and this post: http://www.marcandangel.com/2013/07/25/4-ways-to-quiet-the-negative-voice-inside-you/ – I think both may help you sort through some things. @Mathias: Well said. What goes around comes around. @Violet: Glad we have been able to help you. Honesty truly is the foundation of everything beautiful in this world. @Lynn: Inspiring! It sounds like you made a great change. Best of luck going forward. @All: Thanks for yet another set of inspiring comments. Keep them coming on future posts. Angel and I are continuing to take notes and integrate some of your questions and comments into future articles. I LOVE this post! I took a chance to re-invent myself when I left my previous career and launched my software productivity tool, actionplanr.com. I don’t regret it one bit. As scary as it was, I felt so ALIVE and VIBRANT because I knew that I was creating something that could really help people become more organized and productive without all the stress. thank you sooo much for this article and all of them.. sometimes I don’t get the time to read them but I always save then and look back and this for today was just perfect. thanks again… I’m forever grateful that you guys took a chance and started this blog because you have truly help me and a lot people. thank you and wish you nothing but the best in this world. Listen to your soul. Inspiring! I realize it is a blessing to be able to take chances. Though my choices may be risky, I must take them to get to where I want to be. Without overcoming of risks, there wouldn’t be greatness. Thanks for being my guide, Marc, during the times when I have no maps, compass, or GPS.